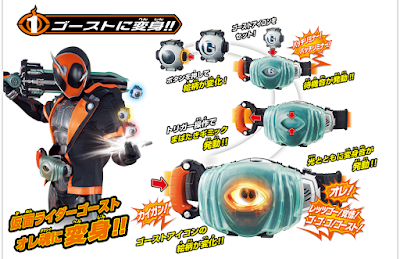 Bandai's official Kamen Rider Ghost website has posted some images depicting some instructions on how to play and operate the DX Ghost Driver. By pressing the button on the desired Ghost Eyecon, Inserting it in the Ghost Driver will make the buckle utter the word “Batchiriminā!” until the lever is pulled out. Pulling the lever will make the eye close it's lid then letting go of the lever will open the eye and activate the sounds and LED and will utter "Let's Go! Kakugo! Go-Go-Go! Ghost!" 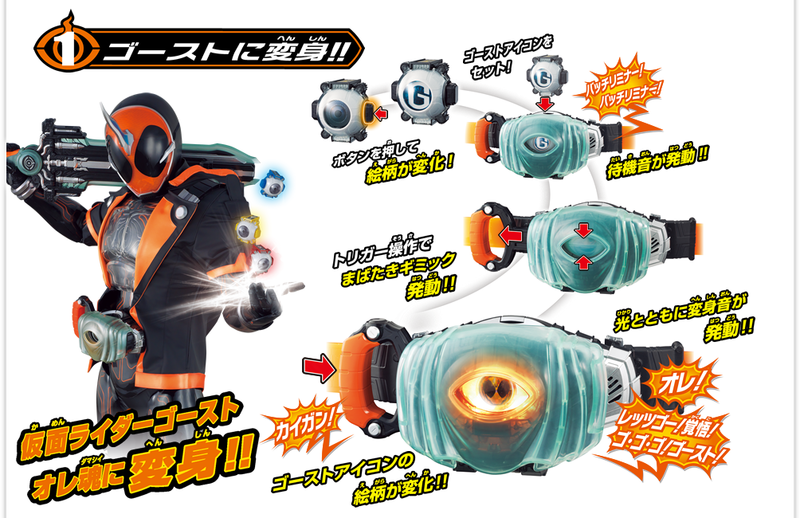 Pulling the lever again will activate the finisher sound of the Eyecon that was inserted in the Ghost Driver ex: Ghost Eyecon - Daikaigan (great eye opener)! Omega Drive! The third image shows the Ghost Eyecon, Edison Eyecon and the Newton Eyecon (that comes with the Surprise Future set). I think the belt has a face. You can see a grinning mouth with teeth. I honestly think it is a mouth,and not just the inner-electronics of the belt,or something like that. So this might be the second year in a row we get a sentient belt. We know where this going, everybody say it with me now SODA!!!!!!! ^lel..thinking the same..GHOST ENERGY ARM.SODA! !